On July 16th, 2015 Beacon Insurance Group received a “Pulling for Kids” Community Support award from the Boys and Girls Clubs of the Lowcountry. 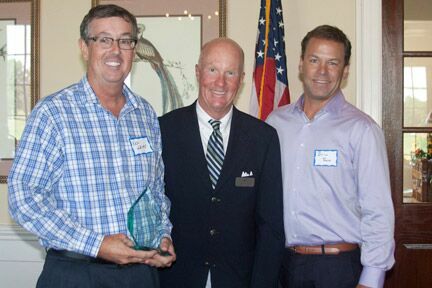 Recipients were recognized for their significant contributions and support of the Lowcountry Clubs. Ken and Brian attended the annual Boys and Girls Clubs of the Lowcountry meeting and award luncheon to accept the award. Here they are pictured with Russ Whiteford, Chairman of the Board for the Boys and Girls Clubs of the Lowcountry. We are very honored to have received this special award. We are proud of the outstanding Boys and Girls Clubs in the Lowcountry and all they do for our community! The real issue is what also occurred yesterday June 24th. A joint Congressional Panel heard 4 State Insurance Commissioners state the following – the average increases in exchange, private and group health insurance premiums will rise 22.5% or higher. The reason, more sick people entered the health insurance system and young healthy people exited. Health rates are well under prices for 2015-16. Right now claims are 2 times greater than the revenues generated. All the plans are “unsustainable”. Some of us knew this over 4 years ago when the Society of Actuaries stated this and it was ignored. Who is the biggest elephant in the room driving up all these costs? Us, we……..
We continue to laugh off wellness, proper diet, exercise, smoking and other detriments to a healthy lifestyle. The frequency of the 5 preventable diseases is the Major Cost Driver of our healthcare costs and thus health insurance costs. It is in your hands, what are you going to do about? Do you own certain items which are special or carry a high monetary value? Are they items that may also appreciate in value or be a one of a kind item? Your homeowner’s insurance policy may not provide you sufficient limits or broad enough coverage for certain personal items such as jewelry, silverware, furs, guns, paintings or other artwork. Many of these items have maximum limits insured under most homeowner’s insurance policies from $500 to $2,500. You determine the value of the items to insure or can submit an appraisal of the item. The limitation is the amount usually provided by the homeowner’s policy is not the only shortcoming for insuring special items. Additional types of risk or perils can be insured under valuable floater coverage such as worldwide coverage, mysterious disappearance, and expand the policy to include claims arising from breakage. If you accidently damage a fragile item by dropping it or it falling off a shelf or wall, it is covered. Many of the valuable article floater policies usually have no deductible. Any personal items which you want the broadest type of coverage should be considered for a valuable articles floater policy. We have all hired contractors to do work around our homes, some jobs big, some small. Did you ever think to ask them if they have insurance? Did you ever ask for proof of that insurance? It is second nature for contractors to provide proof of insurance for commercial work to general contractors or business owners, but for our personal homes most people never ask. So, what is the risk? What if the contractor does damage to your home such as starts a fire? He is responsible but does he have insurance to pay for that damage? What if the contractor had an employee or day laborer to help him on the job and that person was injured. If the contractor does not have workers compensation coverage, that employee is looking to get reimbursed by someone, most likely from you as the property owner. As a homeowner, you should always ask for proof of insurance coverage to protect you. The terminology to use to ask the contactor to provide you with a Certificate of Insurance, usually provided by his insurance agent or insurance company. While utilizing a licensed, insured contractor usually cost more, you are properly protected. Keep in mind, if a contractor has no license, has no insurance and hires cheap unqualified help, what do you think the chances are that the job or work is going to be done to your total satisfaction? When something goes wrong, you are the one holding the bag. When consumers purchase goods and services, they want quality. This is why advertisers place commercials and ads highlighting these traits such as – “FORD TOUGH”, CHEVY TRUCK STRONG”, “AJAX STRONGER THAN DIRT”, heck even toilet paper like CHARMIN touts STRONGER BETTER. When people buy they want it to work and last. Except when they buy insurance. They think all insurance companies and policies are the same. So they get lured into the “cheap.” Just what you want to buy, insurance from a company who may not be able to pay your claim. I recently ran into a client who said he saved a ton of money on his auto coverage. A big strong contractor, who had big strong trucks, and he bought insurance from a company A.M. Best (the rating company) gave a C rating which is “weak”. With a rating that low, they are lucky to last a month, and who knows if they are still around when you have a claim. There are even some insurance companies that have less revenues than independent insurance agencies, how secure does that make you feel? Insurance is there to protect you in your times of need. It is best to pick a company who is going to fulfill that prophecy. We at Beacon Insurance Group, your local independent insurance agency and broker, can give you the analysis to help you make the right choice. Did you know that one of the most damaging claims you can have on a homeowners policy, is also preventable? Water damages to the interior of your home is likely the homeowner insurance claim you will experience. Statistics show that there is almost a 70% chance you will experience some type of water damage claim, large or small. One statistic, which is extraordinary, is that the EPA estimates that over 25% of homeowners have a water leak to which they are unaware. Scary isn’t it? Water damage claims can make you home unlivable and in the long run can also bring on hidden mold damage. Mold damage is usually not covered under a homeowner’s insurance policy. There are steps you can take to prevent and minimize the chances for a water damage claim coming from leaking or burst pipes. Many water damage claims occur when your home is unoccupied for a period of time. Yes, water damage claims from pipes or internal fixtures are covered by homeowner’s insurance, but put up with the inconvenience and the indirect costs associated with a water damage claim. Any ounce of prevention is always preferred. Insurance and Advertising – What are they really trying to say? There are a number of insurance carriers who advertise on TV, but what exactly is there real message? After all, these ads cost millions, so they are all looking for a return on investment. Call me a skeptic but here is the formula as I see it, premiums – claims – operating costs = profit. So, I promise cheaper premiums, my operating costs include millions in advertising and my shareholders want a profit. The only cost variable remaining is claims. I wonder after 15 minutes of saving 15 percent while being by their side if I really am in good hands? Direct writers of insurance are the top spenders of advertising dollars on TV and other media. They will sell you what you ask for, but maybe not what you need. Can you imagine that philosophy if children were raised that way? Independent insurance agents take the time to address you total risk and financial exposure. More options, more ideas, for their clients. Always insist on the level of quality and tradesmen who built the house or certain parts of it. You are not required to accept lesser quality. Did you know that if a person knew the date of their death, it drives up the possibility that they would buy life insurance by over 60%? If people knew there was a disaster coming of some sort, they all want to run out and buy insurance. Why is that? Maybe not as simple as so they can cash in on the event. Most individuals who don’t buy insurance or put it off, just do not believe an unfortunate event is going to happen to them. The problem with unfortunate events, we never know when they are going to occur. Most people are terrible planners when it comes to events which have a low probability of causing a loss. They just don’t think it will happen to them. There have been studies that show insurance buyers will most likely look to insure against common perils or risks which usually cause small losses, instead of large catastrophic risks which have a very low chance of occurring. In essence, people buy based on the chance they can cash in on the insurance, rather than the principle of protecting against catastrophic loss. If a consumer considers buying insurance, the same way they consider gambling, there is a good chance they will not purchase the insurance. These individuals are looking to invest a small amount of money with the hopes of a large payout. We have all heard the buyer state “I paid in thousands of dollars over so many years and never collected a dime because I had no claims.” In retrospect that is a good thing, since you did not suffer the direct and indirect losses a claim can cause. What do you think is one of the biggest mistakes that homeowners make? Not keeping a home inventory! You might say “I’ve never made a home inventory!” or “I don’t know anyone who has a list of all of their belongings!” Well, we are here to tell you that a lack of home inventory could cost you a large amount of money. This might be hard to do, but picture a fire destroying your entire home. You call your insurance company to file a claim on your Hilton Head homeowners insurance and the adjustor asks you for your list of personal property in the home. If you haven’t made your home inventory list, you are going to have a difficult time reconstructing from memory a list of every single item that you own. This, in turn, means that you will not receive reimbursement for everything to which you are entitled. A home inventory list could also speed up the process of your claim and get you back on your feet quicker. At Beacon Insurance Group, we highly suggest that our clients create a home inventory. Use a smartphone to take pictures or videos and email them to yourself and someone else so that they can be kept “on file.” There are also several applications that you can add that will help you create the home inventory and keep it organized for you. We have used “Know Your Stuff” from the Insurance Information Institute and you can organize items by room, add photos, add price of the items and insert seriel/model numbers. With this app, you also get free online storage so you can access your inventory anywhere, anytime. A home inventory is your only backup in a time of loss, so prepare yourself now so you don’t have to deal with the hardships later.